I didn't plan on writing a post today, but then I was straightening my hair last night and had a thought. I'm tired. I feel overwhelmed. I feel stressed...and I think it's all coming from having trouble balancing everything going on. I really had trouble typing that title out and don't want to come off as complaining, because at the end of the day I'm really lucky to live the life I do but I feel like something has to give. I've been saying forever that I need to get on a regular exercise schedule and move every day. I can't tell you the last time I consciously worked out. That's awful and part of why I'm unhappy. I haven't been reading as much as I was a few months ago, and I was really enjoying how many books I was diving in to and sharing them here on the blog. I'm lucky if I read two chapters a day now...usually I'm falling asleep mid sentence. I feel like my blog is slacking and as always, my pictures could be better. My sweet husband bought me this photography book for Christmas...in 2015. I haven't picked it up more than once. He did it in an effort for me to learn more things and play with the camera. All I do is get frustrated and give up because there's many more things I think I could be doing like a load of laundry or sorting mail. Are you sick of me whining yet? Honestly, I don't know how most of you do it. I know it always looks different from the outside, but you women who are putting up blog posts at 5 am staying fit and working and eating good and hanging out with friends for dinner...high five. I'm lucky if I make it out of the door on time lately, and don't even talk to me if I haven't had at least 7.5 hours of sleep. I miss reading 20 blogs every night and commenting and not having to worry about the fact that I haven't even began to answer blog comments from last week...let alone this week. I just want to come to this space and feel like I'm doing enough...creating a community where people are happy and inspired to do something they love and be themselves. Today, I'm probably not inspiring anyone. I'm sorry for that, but sometimes I just need to get it off my chest. Maybe I need to prioritize some things in my life or take a break from some things (ahem, Social Media). I mean, I spent an hour tonight reading Facebook updates and watching Snapchats before beginning to dry my hair--that's just bad. I'm sorry for the sob session today, but maybe you can help me. 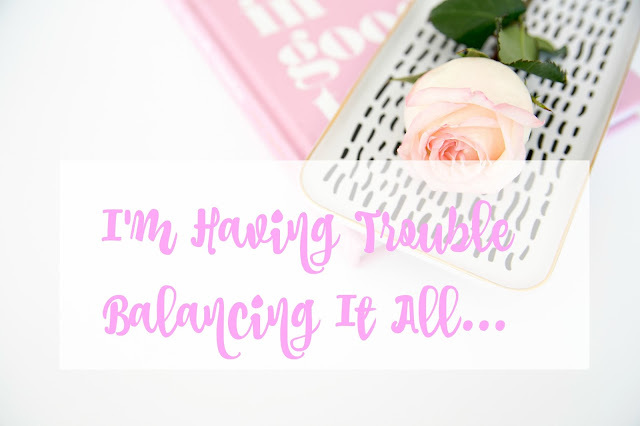 How do you balance it all? Do you ever feel SUPER overwhelmed? Please tell me I'm not crazy. In better news...I'm attending a Mac and Cheese competition this weekend and plan on eating every noodle in sight (probably not helping that balance, but oh well!). Hope you all have a wonderful weekend--thanks for letting me vent today!